On Nov. 28, the University of Iowa College of Public Health honored three leaders whose contributions across a range of disciplines have helped promote better health and prevent disease throughout the state of Iowa. 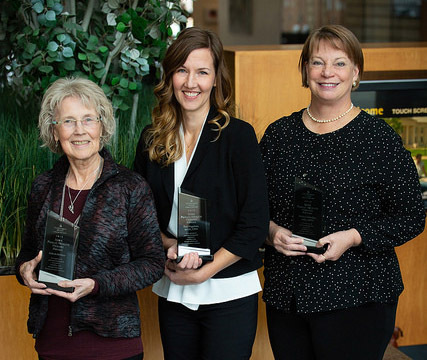 The 2018 Iowa Public Health Heroes Awards were presented to Arlinda McKeen, recently retired from a 25-year career with the State Public Policy Group; Patricia Quinlisk, who served as the medical director and state epidemiologist at the Iowa Department of Public Health for 24 years until her retirement earlier this year; and Kara Vogelson, organizational development and research manager at the Cerro Gordo County Department of Public Health. The recipients gave brief remarks and participated in a panel discussion and Q&A with the audience. The annual Iowa Public Health Heroes Awards recognize exceptional efforts by individuals from diverse career paths who have worked to improve health and wellness throughout Iowa. Award recipients are nominated by their peers in the Iowa public health practice community. Arlinda McKeen has been an advocate for public health in Iowa and a leader in innovative outreach and engagement efforts that benefit community well-being throughout the state. Prior to her retirement in March 2018, she was an integral part of the State Public Policy Group for nearly 25 years. In that time she served as senior program director, VP for programs and services, executive VP and COO, and president and CEO. Two examples of her many projects include developing solutions to long-standing concerns for Iowa’s emergency management system and working with the Iowa Department of Human Services to develop guidance and criteria for rating home-based and center-based child care providers. McKeen was a key partner in gathering information and communicating with stakeholders as part of the effort to establish the University of Iowa College of Public Health in 1999. In 2011, she was essential in helping the college create the Business Leadership Network (BLN), which fosters ongoing, mutually beneficial relationships between the college and small and medium-sized businesses and communities in Iowa. In addition, McKeen helped develop and oversee the BLN Community Grant Program, which provides funding to support projects, programs, and activities that build collaborations and support healthier Iowa communities. Patricia Quinlisk, MD, MPH, served as the medical director and state epidemiologist at the Iowa Department of Public Health for 24 years until her retirement in September 2018. She has been a national leader and a trusted source of health information for Iowans on nearly every health issue ranging from immunization to foodborne outbreaks, preparedness, hepatitis, mumps, measles, monkeypox, and much more. Before her career in public health in Iowa, Quinlisk was a Peace Corps Volunteer in Nepal, where she saw firsthand the importance of public health in preventing diseases. In 1989, she became a Centers for Disease Control and Prevention Epidemic Intelligence Service Officer. In 1998, she was elected president of the Council of State and Territorial Epidemiologists. In 2003, she became a member of the Board of Scientific Counselors in the CDC. She also served on the Emerging Threats to Health in the 21st Century Committee of the National Institute of Medicine. Dr. Quinlisk has trained and mentored the next generation of public health professionals through active involvement at the University of Iowa, the University of Wisconsin, and Des Moines University. Kara Vogelson, MHA, began working at the Cerro Gordo County Department of Public Health in 2002. During her career with the department, she has advanced through multiple positions, including environmental health specialist, healthy homes program coordinator, and assistant health planner. She currently serves as the organizational development and research manager and is the assistant deputy director of administrative operations. Most recently, she has added the duties of regional development and public policy advisor. She has written hundreds of successful grants, facilitated strategic planning sessions, written Community Health Needs Assessments/Health Improvement Plans, conducted trainings, and mentored staff and students. She has served on boards, commissions, and committees locally and statewide. Vogelson organized and initiated the Cerro Gordo County Department of Public Health’s process to become accredited with the Public Health Accreditation Board. Through her leadership, the department became the second in Iowa to achieve accreditation in February 2018. Her contributions as a planner, grant writer, and visionary impact many public health paradigms. In each of her positions, she maintains a committed focus and dedication to helping people live longer and healthier lives.